Microsoft rounds out Surface line with new smaller entry-level tablet. Microsoft has officially revealed the latest device in its Surface line and the new lightweight tablet is ideal for students and mobile professionals. Microsoft's new tablet fills out the Surface line by offering customers a cheaper entry price at $399 and the ability to charge the device using USB-C. The Surface Go is designed for a mobile lifestyle weighing in at just 1.15lbs and 8.3 mm thin which is half a pound lighter than the Surface Pro though still a little heavier than Apple's iPad. The device is powered by a 7th Generation Intel Pentium Gold Processor 4415Y and features a fanless design with up to nine hours of battery on a single charge. 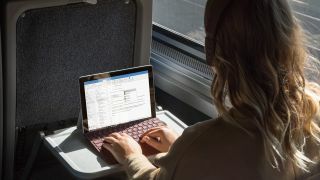 The Surface go also has a wide array of ports including Surface Connect for charging and docking, USB-C 3.1 for data, video and charging, a headphone jack and a MicroSD card reader for additional storage. Surface Go will have full Surface Pen support with 4,096 levels of pressure sensitivity thanks to its custom-built high-resolution PixelSense Display. The device has a 3:2 aspect ratio and a resolution of 1800 x 1200 which will allow for each page of a textbook to be rendered to scale in portrait mode while two pages can be rendered side by side in landscape mode. As far as connectivity goes, Microsoft will launch the Wi-Fi only model first on August 2nd followed by an LTE model later this year. The Surface Go has the potential to be a real competitor to Apple's iPad as it offers similar functionality for users who rely on Windows 10 either at work or at school. However, we won't know how well the device holds up in a real world setting until its launch next month.